Mix the beef and 1/4 cup barbecue sauce in a large bowl. Season the beef mixture as desired. Shape the beef into 4 (4- to 5-inch diameter) burgers. Spray a grill pan or skillet with vegetable cooking spray and heat over medium heat for 1 minute. Cook the burgers for 6 minutes, then turn the burgers over and cook for 4 minutes more or until cooked through, topping each burger with 1 slice cheese during the last minute of the cooking time. Stir the coleslaw mix and mayonnaise in a small bowl. 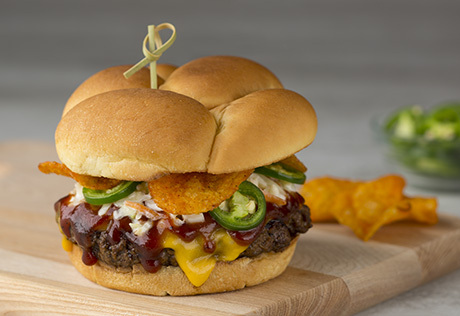 To assemble the burgers, layer each as follows: 1 bottom bun half, 1 burger, 1 tablespoon barbecue sauce, 1/4 cup coleslaw mixture, 3 slices jalapeño pepper, 1/4 cup potato chips and 1 top bun half. Serve with additional barbecue sauce, if desired.